Yahoo investors are done with Marissa Mayer. 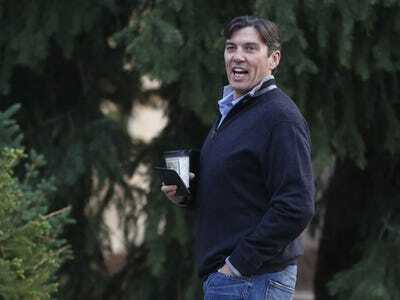 After a little over two years with Mayer on the job, two of Yahoo’s top ten shareholders have approached AOL CEO Tim Armstrong about running Yahoo, Nadia Damouni and Jennifer Saba at Reuters report. How Armstrong would end up running Yahoo is a bit unclear. Investors wants Yahoo and AOL to merge, and then Armstrong would ascend to be CEO. What happens to Mayer in this transaction? Who knows. Presumably, she’s tossed. This is just the latest slap in the face to Mayer by a restless investment community. Earlier this year, Eric Jackson, a fund manager with a small stake in Yahoo began bashing Mayer in blog posts at Forbes, and on TV. Jackson was a fan of Mayer for years, but he flipped his opinion rather suddenly. Then, Starboard, an activist fund that had a stake in Yahoo started a war on Mayer with an open letter questioning her various decisions. 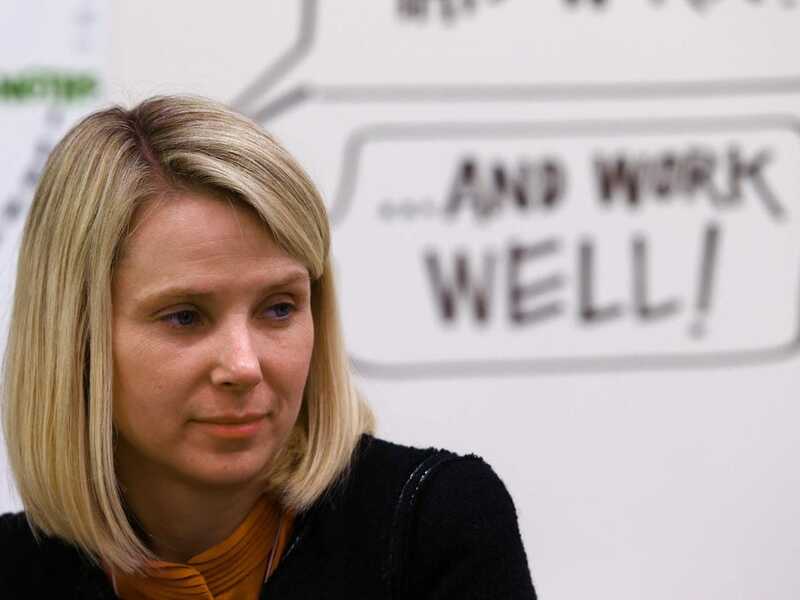 What has Marissa Mayer done to these investors to earn their scorn? Well, as Reuters points out, since she took over as CEO, Yahoo’s stock price has tripled. But what has Tim Armstrong done to earn investor’s love? Well, he’s doubled AOL’s valuation since taking over. I’m not a maths scientist, so I could be missing something here, but I’m almost certain that tripling is better than doubling. REUTERS/Denis BalibouseMarissa Mayer is a maths scientist and she can tell you that 3X is better than 2X. But, lots of people will say that Mayer doesn’t deserve credit for Yahoo’s share price tripling. 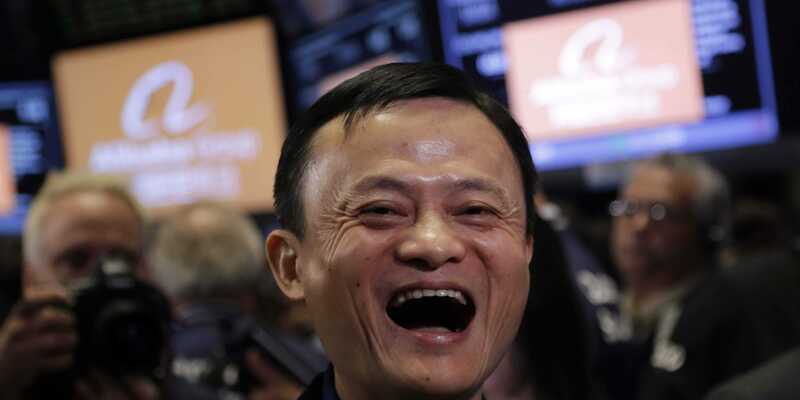 They say that the only reason it tripled is because of Chinese e-commerce giant Alibaba. Yahoo has a massive stake in Alibaba. When Mayer took over, Alibaba was a private company worth ~$US30 billion. Two years later, Alibaba is a public company worth close to ~$US300 billion. For two years, there was no way for public investors to get exposure to Alibaba other than to buy Yahoo stock. This is what drove Yahoo’s stock price to near-record highs. Alibaba most certainly was the primary driver of Yahoo’s share gains. 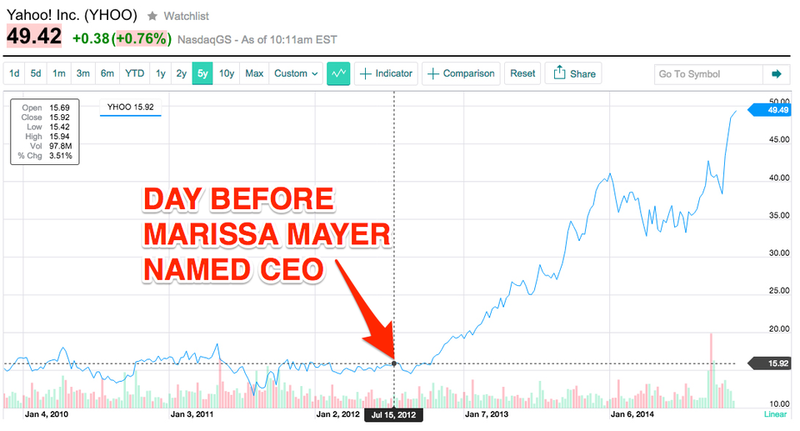 But Mayer could have very easily destroyed Yahoo’s share gains with stupid management decisions. In fact, Mayer deserves credit for nurturing the relationship with Alibaba. Previous Yahoo CEO Carol Bartz was disrespectful to Alibaba CEO Jack Ma, hurting Yahoo. Mayer became friendly with Ma, and her efforts allowed Yahoo to hold onto more Alibaba shares, which have appreciated in value, thus benefiting Yahoo. She has made managerial mistakes, but none are catastrophic. Her biggest mistake was hiring Henrique De Castro to run ad sales. He was not the right person for that job. She fired him after a little over a year on the job. After firing De Castro, Mayer got more involved in learning the ad sales side of the business. She just hired Amazon’s head of global ad sales, and she’s been building up more and more ad sales people. This is important since Yahoo’s ad business is flat, which is the main complaint from investors. Mayer and her new hires need to get the ad business turned around. But that doesn’t happen instantly, just ask Tim Armstrong. Armstrong is being deified by investors because he has AOL’s ad business growing. This is an impressive feat, but it took years. 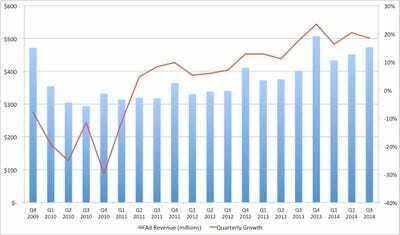 Look at this chart of AOL’s ad revenues and quarterly revenue growth. Armstrong was named CEO in March of 2009. 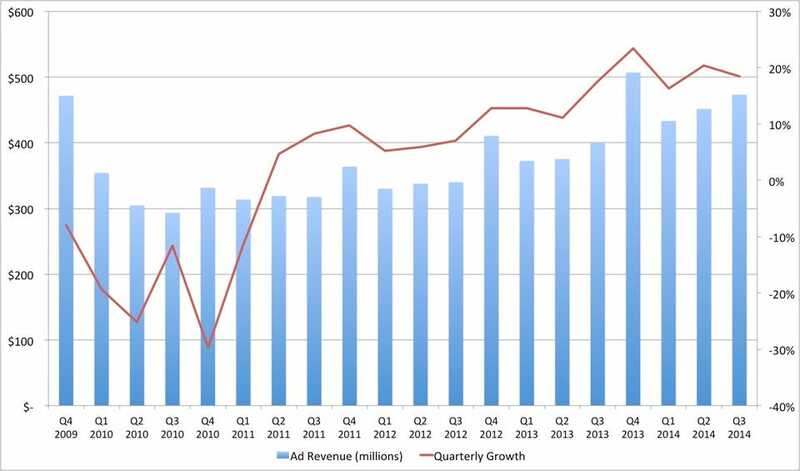 As you can see, AOL’s revenue was flat for the first two years Armstrong was CEO. It wasn’t until Q1 2012, almost three years after he was named CEO, that revenue really started taking off. What happened between the time Armstrong was named CEO, and the company’s revenue started taking off? A lot of stuff! Armstrong churned through executives. He bought Patch, and burned hundreds of millions of dollars on it. He was accused of overpaying for Huffington Post when he paid $US315 million for it. He fired people. He struggled to nail his vision for AOL. And, importantly, he was attacked by the activist shareholders at Starboard who thought he was mismanaging AOL. Eventually, Armstrong got past all of that. He zeroed in on AOL’s strengths and managed the company to growth. He deserves all the accolades he’s receiving for getting AOL pointed in the right direction. However, it seems like people are forgetting that it took him years to get it right. 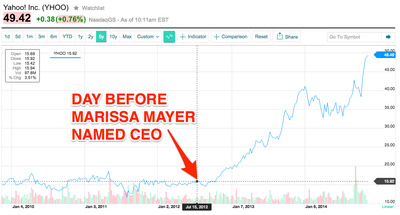 And investors are unfairly crushing Mayer after just over two years in the job. Mayer is learning on the job, just like Armstrong. She’s bounced from vision to vision. Initially it was mobile, mobile, mobile, then it was content, content, content. There’s nothing wrong with changing your mind. As Jeff Bezos says, people who are right a lot of the time are people who often change their minds. Could she be doing a better job? Of course! Many of the criticisms of Mayer are justified. She has failed to grow Yahoo’s top line. She hasn’t cut headcount to increase Yahoo’s profitability. She hasn’t grown ad revenue. She hasn’t latched onto a viable, working business plan to vault Yahoo to the upper echelon of technology companies in the next 10 years. But it’s still early. And these criticisms would have applied to many executives in their early days trying to turn a company around, including Armstrong. Is Mayer the right person to lead Yahoo? If investors just want to tear Yahoo apart and turn it into a holding company for Alibaba shares, then she’s the wrong person for the job. Someone else should do that. Yahoo FinanceREMINDER: Yahoo shares have done well. But if shareholders want to aim a little higher, and hope that Yahoo can be a holding company and a viable technology company, she seems like a good fit. She’s made a completely irrelevant company at least somewhat relevant in the technology industry. She’s infused some life into Yahoo. Mayer is not dumb. She can be strong headed, and strong willed. But she can see that revenue is flat. She can hear loud, powerful critics preparing to storm the castle. She knows that it’s time to start proving that Yahoo can grow. Yahoo has spent $US7.7 billion to buy back shares. That’s 24% of the company. And it’s well above what Yahoo said it would do. 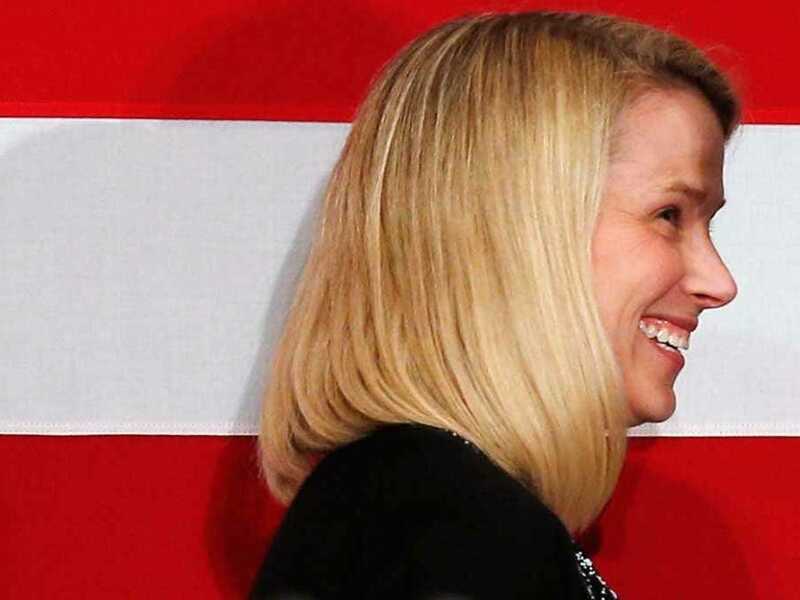 Yahoo has only spent $US1.6 billion on acquisitions since she took over. Of that, $US1.3 billion, or 80%, was on two companies — Tumblr, which was $US1.1 billion, and $US200 million on Flurry. The vast majority of Yahoo’s money is going to buybacks, not acquisitions. Tumblr’s revenue is growing, and it is on pace to do $US100 million in revenue next year. It will also be EBITDA positive. The native advertising business, which is brand new, is on a $US250 million run rate. Gross revenue from mobile advertising will be $US1.2 billion this year. She also said, “ we have had nearly 2,000 performance related departures in the company.” Yahoo has been accused of being too bloated, so this is her way of saying the company has slimmed a bit. So, is her run as CEO perfect? No. But, the share price has tripled. She’s returned money to shareholders, she’s invested in native advertising, and she’s starting to monetise Tumblr, a big platform with big potential. She’s forming a coherent media strategy, and she’s improving Yahoo on mobile devices. Fixing Yahoo wasn’t going to happen overnight. Any new CEO that stepped in was going to need at least a year to understand the nuts and bolts of the place, and then another year or two at least to set a turnaround plan in motion. Tossing Mayer for a new CEO would just start that process all over and leave Yahoo right back where it was before Mayer got there. advertising marissa mayer sai-us yahoo!